The Marine Mammal Center began conducting research on marine mammal diseases almost from its inception in 1975. Because animals in the Center’s care offer a unique opportunity to perform blood and tissue analyses, the team has discovered conditions that bear upon the work of the organizations we collaborate with including National Marine Fisheries Service, NOAA and a variety of universities, regarding the health of the ocean. 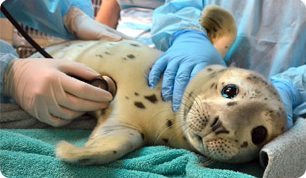 The Marine Mammal Center has become, in a sense, one of the top resources for researchers and scientists to turn to for answers about marine mammal care, medicine, and health data.